Various studies have shown that “psychosocial stresses” – such as racism – can raise a woman’s level of cortisol to dangerously unhealthy levels. Cortisol regulates everything from metabolism to the body’s immune response. That’s where Latona Giwa ’09 comes in. 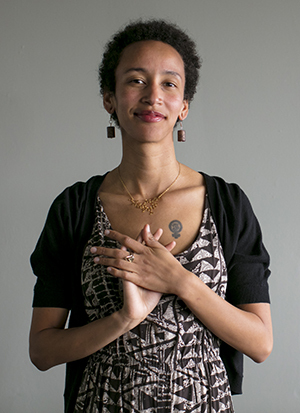 The New Orleans registered nurse in 2011 founded the Birthmark Doula Collective to provide emotional, physical, and educational support to mothers-to-be, most of them black and poor. Giwa moved to New Orleans after graduation to serve as a Grinnell Corps fellow (fellows perform community service and promote leadership and social integrity). “Certainly, the pregnant families that we’ve worked with often articulate a number of stressors and challenges that they’re experiencing, such as poverty, issues finding work, discrimination at work, and the difficulty in finding supportive providers,” Giwa says. In medical circles, a consensus has developed attributing hypertension and preeclampsia (a combination of high blood pressure and damage to organ systems — typically the liver and kidneys) to the stress brought on by racism. Both conditions can result in infant death and even maternal death. “Unfortunately, those rates are getting worse over time instead of better,” Giwa says. Doulas, however, are being hailed for improving birth outcomes. But in 47 states, doula services, which typically start midway through the second trimester, are not covered by insurance. Birthmark, which is partially grant-funded, provides care on a sliding scale. “Doulas are shown to reduce C-section rates really dramatically, by between 30 and 50 percent depending on the study, reduce the rate of unnecessary medical interventions, reduce the use of anesthesia and epidural medication, and thereby improve birth outcomes,” Giwa says. “Black births matter” is a rally cry that Giwa coined. Challenges don’t just come at birth. Stress has been attributed to another troubling statistic: Black infants are twice as likely to die in the first year of life as white infants. The 28-year-old Hagan, thanks in part to Giwa, escaped the misfortunes faced by other African-American moms. She gave birth three yours ago to a healthy daughter, Sariya. Giwa’s influence was so consequential that Hagan became a doula herself. She now is one of a dozen doulas working for Birthmark, which helped shepherd the pregnancies of 500 women in 2018. There are reasons for optimism in some states. Giwa was asked in the past year to sit on the Louisiana Department of Health’s reinstituted Maternal Mortality Review Board, in which doctors and community health workers like herself are “elucidating and drawing the connection between social determinants of health and these horrible outcomes,” Giwa says. Birthmark’s efforts extend to postpartum care (sometimes referred to as the fourth trimester), during which women learn the importance of infant feeding, future pregnancy plans, and specific health needs. Family nurse practitioner and lactation consultant Nikki Greenaway makes home visits to new moms in conjunction with Birthmark. Greenaway and Giwa in 2018 opened the New Orleans Breastfeeding Center. Breast milk, with its potent antibodies, is hailed for giving infants a healthy start on life. Giwa, a sociology major, came to Grinnell already embodying social justice sensibilities. But the College, she says, gave her opportunities to cement her worldview in ways she couldn’t have elsewhere. As a first-year student, Giwa enrolled in a community organizing tutorial taught by Chris Hunter, professor of sociology, senior faculty status. It quickly became clear to Hunter that his protégé was “eager to embrace the material. At Grinnell, Giwa developed the now-defunct Voicebox, a student-led group that served as a resource center for all campus activist groups, which normally operate independent of one another. Voicebox provided training for students to “learn how to do their thing,” Hunter says. “Latona was really interested in promulgating a broader movement among the students that would work better together,” he adds. Giwa also developed a peer education group dedicated to social justice. The program, called A Just Grinnell, carried the slogan “Learning Oppression, Creating Community.” Like Voicebox, A Just Grinnell ran a social justice training program and received funds from the College to aid in its efforts. Additionally, Giwa helped supervise the Grinnell Community Meal, created in 2000 to build community with the town of Grinnell. The weekly event is coordinated by the Grinnell Social Justice Action Group. In her native Minneapolis in 2007, under the guidance of Hunter and with a nonprofit called StreetWorks Outreach Collaborative, Giwa helped to produce a guide for homeless children and teens that lists social service support organizations. The internship with StreetWorks, after her second year at Grinnell, gave Giwa her earliest ideas for a birth justice movement. Grinnell classmate Leah Krandel ’09, an independent studies major (marginalization in American society), works closely with Giwa as a biology teacher and director of mental health at New Orleans’ G.W. Carver High School, a public school in the Ninth Ward. Giwa recently spoke with one of Krandel’s biology classes about opportunities for careers in the sciences, and she also highlighted challenges facing pregnant black women. Krandel has referred pregnant students — as many as five per academic year — to Birthmark. Krandel, who is white, used Birthmark when she delivered her own daughter seven months ago. 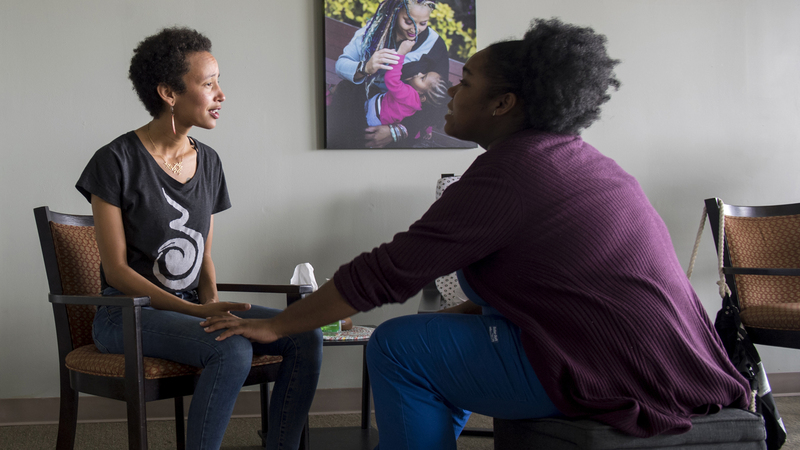 The doula stayed with her during the course of her 16-hour labor, telling Krandel what to expect and encouraging her to be an “advocate” for herself. “The medical personnel changed out about three times while I was in labor, so my doula was the constant while everyone else around me was changing,” she says. Giwa, for her part, escaped complications in delivering her daughter, Emory, three years ago. It’s an outcome that she’s tried to replicate with the thousands of women that Birthmark has assisted. New mom Hagan says Giwa has an enviable aptitude.